If You Knew Peggy Su! For most westerners, a film in English and Mandarin, about a Chinese girl looking for the love of her life while working in a Chinese laundry in 1960's Liverpool might not be everyone's cup of Chai. However, Frances -Anne Soloman's delightful 1997 romantic comedy Peggy Su! has more charm than any syrupy Richard Curtis fantasy. Written by Anglo-Chinese playwright Kevin Wong, Peggy Su! tells the story of 19-year-old Peggy (Pam Oei) who arrives from Hong Kong to work in the Chinese laundry run by her brother Jack. Despite having a husband chosen for her by her father (Burt Kwouk), Peggy is determined to marry for love and sets out on a race against time to find her ideal man. Much of the film concerns Peggy's attempts to find a husband out of her daunting three choices. There's her father's choice, the socially and physically inept cousin Gilbert (Adrian Pang); smoothie Anglicised Chinese restaurateur David (Glen Goei); plus delivery man Terry (Vince Pellegrino), the outsider. Suki Smith currently making waves in the music industry in her musical guise of Madam plays Rita, Peggy Su's sister in law. Peggy Su! was the first feature film to receive National Lottery funding with the balance made up by the BBC. Peter Spencer's soundtrack spans a sort of jazzy latin pop with a oriental feel mixed with girly 60's pop. Standout tracks include Peggy Su's Blues and the heart warming Ain't That Funny? Like the movie it's an exotic mix with a magical and happy ending. Joi Geen everyone! During WW2, the US Department of State commissioned Walt Disney to make a movie that would appeal to Central and South American audiences. Evidently there were concerns that governments like Argentina who had close ties with Nazi Germany could possibly sway the outcome of the war in favour of the Axis powers. Disney's solution was Saludos Amigos, (Hello Friends), the first of two feature length latin excursions by the studio. Released in 1942 by RKO Radio Pictures, Saludos Amigos is set in Latin America and split into four segements comprising a live action travelogue, Goofy the Gaucho and two Donald Duck segments. The second Donald Duck short introduces a new character, José Carioca a Brazillian parrot played by José Oliviera. It features the breathtaking Acquarello do Brasil samba sequence which links Amy Barroso's classic Brazil and the popular Tico-Tico in a stunning tableau of colourful and imaginative animation. Although Saludos Amigos picked up mixed reviews, it was popular and profitable enough for Disney to produce another Latin flavoured short feature, The Three Caballeros. Released in 1944, The Three Caballeros reunites Donald Duck with José Carioca and adds another latino character, a Mexican rooster called Panchito Pistoles to make up the the titular three caballeros. Like its predecessor, The Three Caballeros is an omnibus feature, but it is a quantum leap from Saludos Amigos, with more songs and some eye-popping sequences including Os Quindines de Ya Ya sung by Carmen Miranda's sister Aurora against an animated background of dancing houses and other assorted Latin phantasmagoria. Both Saludos Amigos and The Three Caballeros feature some great latin music and are essential listening. The performances in the movie are especially stunning. Recordings extracted from 78's released at the time but not featuring the artists in the movie are available here The Three Caballeros (week 34) and Saludos Amigos!. (week 18). Originally created as goodwill messages to Latin America and allegedly a means to allow Walt Disney to temporarily escape the turmoil at his studio created by industrial action and the partial take-over by the US Army, Saludos Amigos and The Three Caballeros have perhaps been overshadowed by other Disney masterpieces. Today they can be viewed more objectively and seen as notable examples of animators being allowed to experiment and let their creativity run riot with dazzling results. Released in 1939, Gulliver's Travels was the Fleischer Studio's first animated feature. Originally concieved as a Popeye short, Fleischer's distributors, Paramount Pictures wanted a feature length cartoon like Disney's Snow White. So Popeye got cast overboard and Gulliver's Travels set sail as a 79 minute technicolor cel animated masterpiece. Loosely based on Jonathan Swift's 18th Century novel, the film follows Gulliver's Liliputian adventures where the kingdoms of Blefiscu and Lilliput argue over which song to play at the wedding of Prince David of Blefiscu and Princess Glory of Lilliput instead of fighting over which end of a boiled egg to break first. 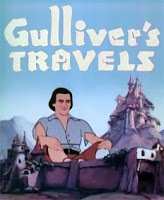 Although much of the animation is easily the equal of Disney's output at the time, Gulliver's Travels differs from the 'house of mouse' with its extensive use of rotoscoping especially for Gulliver himself. Much of the Fleischer studio's trademark ingenuity and imagination (as seen in many Betty Boop shorts) is evident throughout the movie particulary in the scenes of the capture of Gulliver and his later duding up by the Lilliputians. Gulliver is big, noble and wise, but the Prince and Princess are a bit bland and don't do much apart from be lovey-dovey and sing. The humour in the movie is provided b y King Bombo and King Little; Bombo's spies Sneak, Snoop, and Snitch; and Gabby, Lilliput's town crier, voiced by Pinto Colvig, the voice of Disney's Goofy. Although a hit at the time, Gabby (who spawned a number of follow up shorts), seems to be a composite of all Disney's Seven Dwarfs and as such is a bit abrasive (as in annoying) by today's standards. Like Snow White, Gulliver's Travels, features some charming songs including the feel good, It's A Hap-Hap-Happy Day, Gulliver's lump in the throat Sailor Man song and the romantic Faithful Forever. Victor Young is credited with 'atmospheric music' and adds an epic and lush sheen to the proceedings. Although cover versions of the songs in the film have been released over the years, no official soundtrack exists. William T Stromberg recently recreated several key cues from the film on a collection of Victor Young's film music. With no official score on the horizon, it has been left to fans to search for old 78's of the tunes or create their own unofficial soundtrack cobbled together from available music and musical extracts from the DVD of the movie. Although Gulliver's Travels was a box-office success, history seems to compare this magical movie unfavourably against Snow White which is unjustified. Gulliver's Travels was sold off following the collapse of the Fleischer Studios due to financial problems. It is now in the public domain and readily available on DVD and viewable on numerous websites. Alas some awful transfers of the movie have tarnished its original glory. There are however some decent versions of the film available now, in fact Amazon is currently promoting a 'special edition', though information about it is sketchy. Potential purchasers should always buy from a reputable retailer like Amazon and read the reviews to ensure they see Gulliver in the way it was meant to be seen. 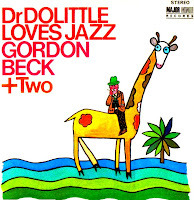 Back in the mists of 1968, my jazz mad elder brother brought home an LP called Dr Dolittle Loves Jazz by Gordon Beck. Having recently seen the Rex Harrison movie, Dr Dolittle, I was intrigued to hear how Beck could transform Leslie Bricusse's jolly show tunes into frenetic Bill Evans style jazz. 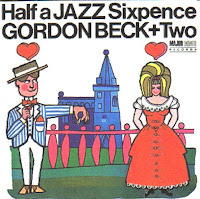 London born self taught jazz pianist Gordon Beck was a member of the legendary Tubby Hayes Quintet in 1962. In the late 60's Beck formed his own trio, Gordon Beck + Two who became the house band at Ronnie Scott's Club. In between contributing to several movie soundtracks and working with composers such as Lalo Schifrin, Benny Golson, and Gary McFarland, Beck recorded three albums for the Major Minor Records label Dr. Dolittle Loves Jazz, Half a Jazz Sixpence and Experiments with Pops - the latter featured John McLaughlin on guitar, which adds another dimension to Beck's distinctive style. 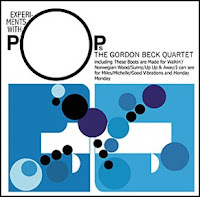 Each album displays Gordon Beck's virtuosity and flair along with his fluid and sometimes explosive piano style. If you are a fan of late 60's British modern jazz and want to hear a jazz 'joanna' legend, then slick your hair, slip on the shark skin suit and shades and give these albums some room in your world.